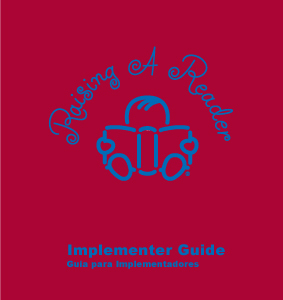 RAR prints eight different booklets (Four different titles, each in both English & Spanish), and provides them along with other printed materials and a DVD to program implementers (teachers, administrators, etc.) in a hard plastic attaché case. Find a lower cost alternative that also consolidates the materials for easy storage and retrieval by the client. The booklets are quite expensive, each one saddle-stitched, and running from 20 to 40 pages + cover. Order quantities are low because the contents tend to change fairly often. Create a bi-lingual 3-ring binder with tabbed section dividers for each chapter (one for each booklet title). Since the titles do not change, these items can be printed in large quantities for reduced unit costs. Booklet pages can be printed digitally, so order quantity becomes much less of a cost factor. Binders produced with DVD holder on the inside front cover, and pockets on both inside covers, so the additional teacher materials can be included in the binders. The average cost of the materials dropped by 15-35% (depending on order quantity), with greater flexibility to make copy changes with reduced spoilage.